Set in the heart of the enchanting Lot valley, L'évasion boasts a wide range of excellent facilities for guests to make use of. LuxCamp takes care of all the details to make getting back to nature very easy. Nature lovers are sure to enjoy strolling through the forest that surrounds L'évasion, while wine enthusiasts will want to allow plenty of time to explore the neighbouring vineyards. 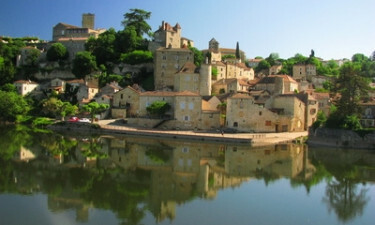 The village of Fontes is located just two miles away and is nestled on the banks of the gently flowing River Boyne. 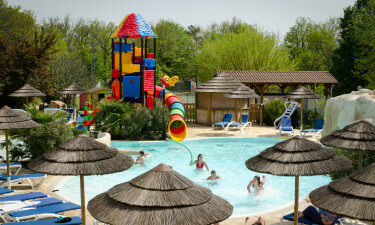 The kids are sure to have plenty of fun on their camping holiday, as the site boasts a large outdoor aquatic theme park that is complete with a colourful play area and water slides. The kids are also treated to a separate outdoor play area, equipped with a bouncy castle and climbing frame. Luxury camping lovers will be able to dine in style at L'évasion, as the site has its own excellent restaurant. In addition to enjoying a range of classic French dishes, this is also the perfect place to sample a glass or two of locally produced wine while unwinding in style.